Q Awards Winner! This Black IPA is triple hopped with huge hop volumes of all the American C’s expected of the style. The malt is in the back seat for this one, as there is enough dark malt to give colour and a limited roasty flavour with no malt astringency. Black Lightning is hopped from the mash to the fermenter. We use Willamette, Chinook, Cascade, Summit and Centennial hops in very large volumes, about 100% more than a regular beer, but we don’t make it too bitter. 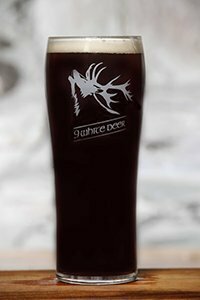 Black Lightning is 56 IBU and the water profile is adjusted to make the hops seem more rounded rather than sharp and harsh which can easily happen when using so much hops. 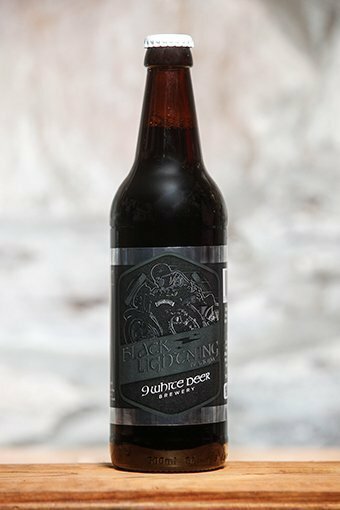 Black Lightning will pour with a big rocky creamy head and it looks like a stout but once you come close to an opened bottle the aroma will tell you it could not be further from one. Black in colour with slight dark malt qualities but in other senses it’s a big American style IPA. As the two brewery owners; Don O’ Leary and Gordon Lucey are both keen bikers, this is a nod to the 1952 Vincent Black Lightning bike. The Vincent Black Lightning bike was well ahead of it’s time. When all around had about 12 or 14 horsepower, this beast packed 70 odd in it’s big V Twin. As well as that, the whole Saint thing would not sit well with this branding so for this one we veered a little. A powerful, high achieving show-stopper.